There’s nothing like the feeling of knowing your most valuable asset is protected from the elements. 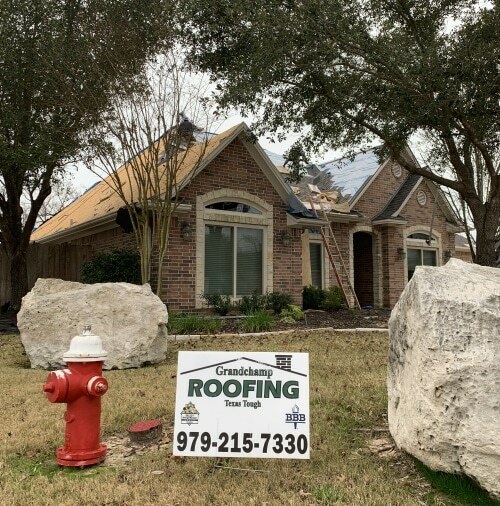 A new roof can give you peace of mind that your family will be sheltered properly and your home protected from the rain, sleet, hail and crazy Texas weather! 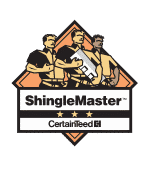 Grandchamp Roofing roofs give you that piece of mind knowing you have a full warranty on the shingles and work that we perform. We back up everything we do, not just with words….we guarantee it! 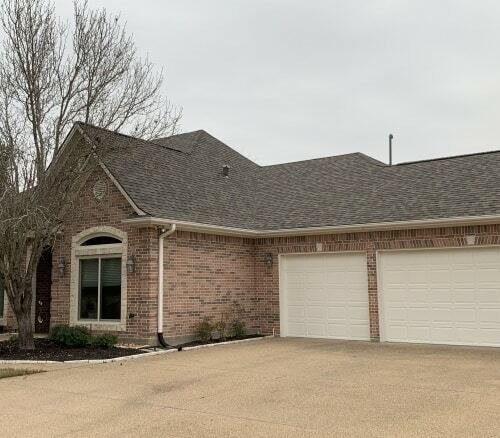 We love our customers and we’d love to add you to our family of satisfied family’s that have trusted us to give them a new roof and worry free protection. Give us a call! Every roof has its own unique challenges and this one was no different. 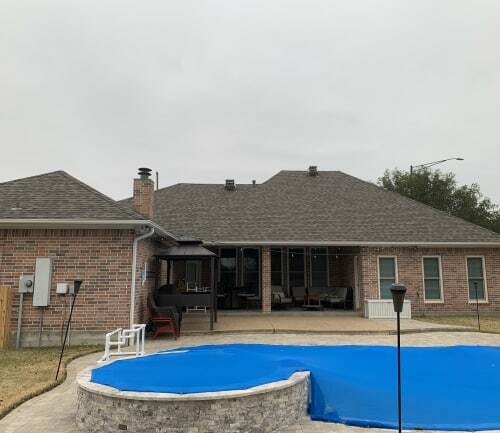 With a swimming pool in the back yard, there is a chance of debris getting blown into it. There are also plants and bushes around the house that could get damaged when removing the old roof. 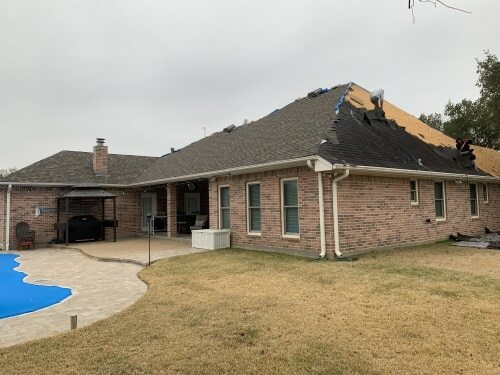 And in Texas especially, there’s always the danger of a storm blowing in just as soon as we get the old roof removed. Read on to learn how Grandchamp Roofing addresses each of these challenges head on. When there is a swimming pool near where we are removing an old roof, we pay special attention to tarp and clean up over and around it. 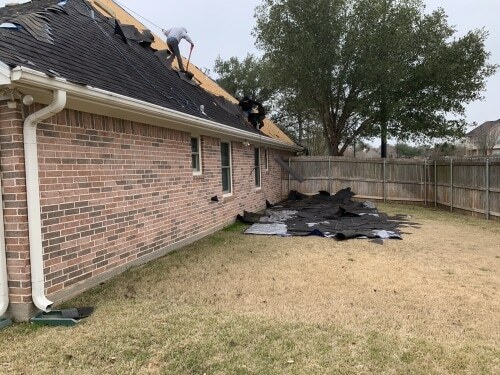 Plants and hedges around a house are also covered and special care taken with ladders and the discharge of old shingles off the roof. We get many complements on how we take care of our customers plant life! We spend extra time and go the extra mile when it comes to clean up. Preparation is paramount and being ready for the unexpected, like a thunderstorm popping up, are necessary with Texas weather. We come prepared with tarps and lines just in case. It’s the little things that keep our customers writing those five star reviews and we plan to keep it that way! 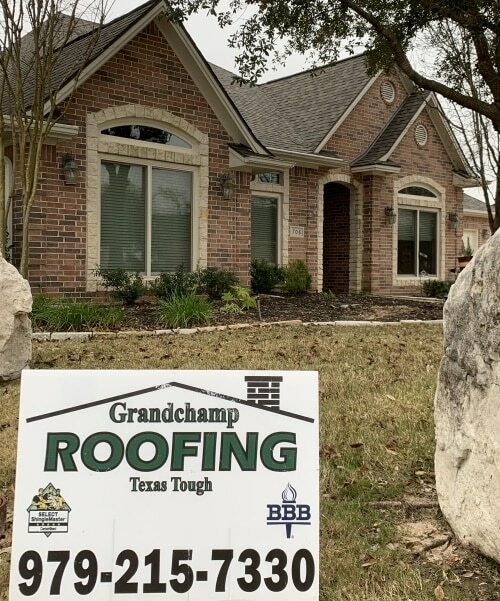 Grandchamp roofing is your solution for new, replacement, repair or maintenance. Quality while maintaining affordability is our specialty. 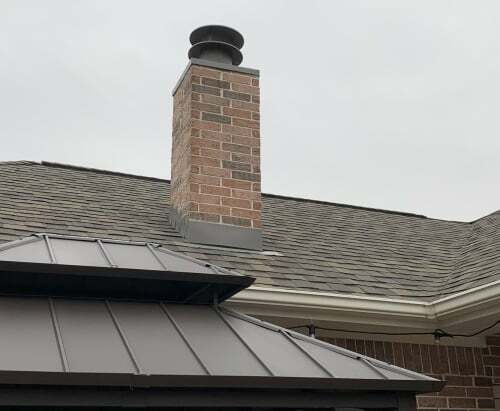 Let us give you a free estimate for your new roof project today!